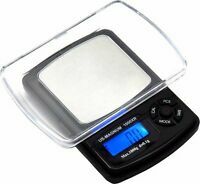 Weigh jewelry with accuracy when you have this gray mini digital balance and scale. 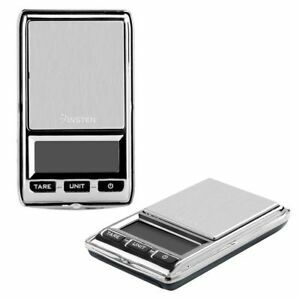 It weighs items from 0.01 to 500 grams and uses a liquid crystal display. The scale itself weighs just 36 grams, making it easy to transport. There are seven unit selections, and it also has a tare function. It's battery-operated and uses minimal power for a long battery life. It measures 7.5 centimeters wide by 4.5 centimeters long by 1.3 centimeters tall. Item as described and in good condition. Super fast delivery. There was no indication in the description that it came without batteries. Very small! Doesn't look that small in pic. They removed battery from package. 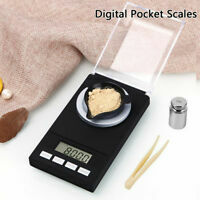 This is a great value for a pocket, diamond scale. Be sure that is what you want! This scale is tiny! Like hobbit sized tiny. It cannot be used for anything other than gems (possibly other tiny objects). Also be sure to order the batteries, they aren't too expensive but can take a while to get if you must order. Other than that it is a good deal. The scale works as advertised but I was disappointed because the auto turn off function kicks in too soon for my purposes. There might be a way to change it but the instructions don't indicate it's possible. I was planning to use it for weighting small crystals and I believe it's great for the value. There's only a little wobble that doesn't concern me, neither does it affect the precision level that matters to me. Overall pretty satisfied with the deal and recommend it. Will buy another for a friend with similar need. Great service and quick shipping. Case is hard to open. Unit is smaller than expected but it does work very good and easy to use. Much smaller than I expected - about the size of a business card. It's very lightweight and easy to use. The display has poor contrast from certain angles and the backlight is not very even, but overall is still fairly easy to read. It seems fairly accurate - I measured a new US quarter and it was within 1 or 2 hundredths of a gram of the supposed weight. Measurements vary a tiny bit depending on the placement on the platform, but that's a minor quibble for such an inexpensive device. Overall, I'm very happy with its operation. My one disappointment was that the lithium coin cell (CR2032) was not included, although looking back at the auction description they clearly stated that. I like that it uses a lithium battery instead of similar scales that use alkaline 2xAAA. I've had too many electronic devices in the past whose alkaline batteries start leaking with age and cause damage. Never had that problem with lithium cells.